The non-partisan Tax Foundation recently released its annual Tax Freedom Day report. This year Tax Freedom Day nationwide fell on April 23rd, 113 days into the year. In Massachusetts it arrives 12 days later, tomorrow on May 5th — ahead of only New York (May 11), New Jersey (May 13), and Connecticut (May 21). According to the Tax Foundation, this "is a significant date for taxpayers and lawmakers because it represents how long Americans as a whole have to work in order to pay the nation’s tax burden." Taxpayers of Massachusetts ranked 47th-latest in how long Americans as a whole have to work in order to just pay their federal, state, and local tax burdens. ● Americans will pay $3.5 trillion in federal taxes and $1.6 trillion in state and local taxes, for a total bill of more than $5.1 trillion, or 31 percent of the nation’s income. ● Americans will collectively spend more on taxes in 2017 than they will on food, clothing, and housing combined. 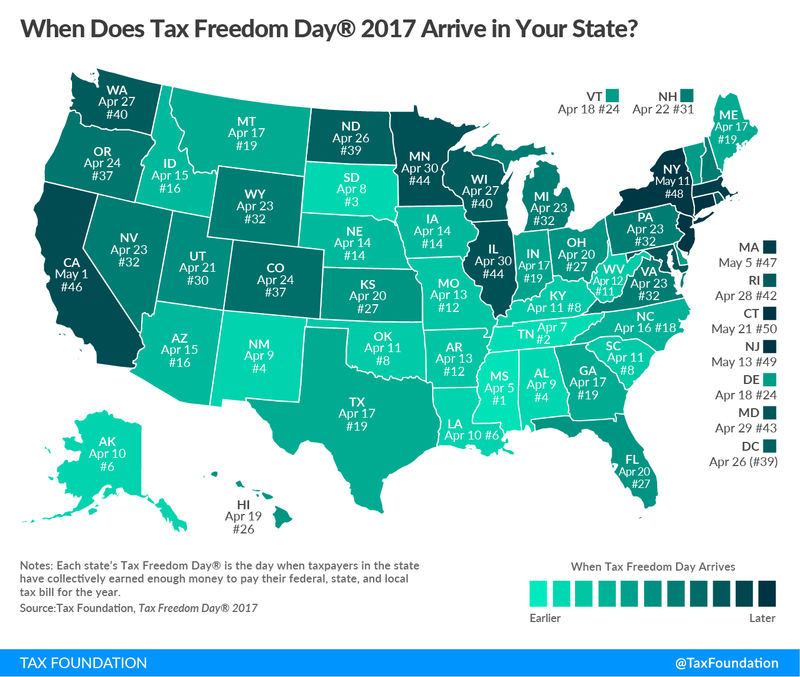 ● If you include annual federal borrowing, which represents future taxes owed, Tax Freedom Day would occur 14 days later, on May 7. ● This year, Americans will work the longest—46 days—to pay federal, state, and local individual income taxes. Payroll taxes will take 26 days to pay, followed by sales and excise taxes (15 days), corporate income taxes (10 days), and property taxes (10 days). The remaining six days are spent paying estate and inheritance taxes, customs duties, and other taxes. Massachusetts taxpayers will work 125 days just to pay their taxes — 12 days longer than the national average. This again proves that Massachusetts does NOT have a revenue problem. Beacon Hill has an INSATIABLE SPENDING ADDICTION. The Legislature's recent obscene $18 million pay grab is clear and undeniable evidence.